Serena Williams was originally scheduled to play here but recently withdrew. (16) Sam Stosur vs Caroline Wozniacki: Wozniacki has finally found some form in 2016 after struggling for most of the season. The Dane is set to play the final in Tokyo after defeating Radwanska in the semi finals. Stosur is a tough round one though, and the head to head shows how close these contests are. Wozniacki leads 6-5 in the series with the latest match going the way of the Aussie via retirement. A few of their meetings have gone the distance, so there is a fair chance of that happening here. One must wonder how Wozniacki will be physically after her efforts in Tokyo, but when you are in good form it can sometimes matter little. (15) Roberta Vinci vs Monica Puig: Vinci’s ranking may have dropped post the US open, but the Italian is still a crafty player that is difficult to beat. The former US Open finalist will be met by the Olympic Champion, Puig, in the opening round which will pit style vs style. The slice and dice of Vinci vs the power of Puig will be an interesting contest, and one that could go either way. This will be only their second meeting, and the first on a hardcourt. It must be noted the difference between Puig this year compared to last, and that could be the difference. Kerber’s quarter: The US Open champion is back in action as the number one player in the world. Who would have thought that 12 months a go? However, being the top seed has not done her many favours with the draw as she will face either Kristina Mladenovic or CoCo Vandeweghe in round two, both of whom are capable of an upset. The first seed Kerber will meet is Kvitova, but of course nothing is certain with the Czech. Suarez Navarro is still reaping the rewards of consistency with her seventh seeded position in the draw, a position that grants her an opening round BYE. The second round prospect does not look bad with either Yania Wickmayer or Shelby Rogers awaiting the Spaniard. Johanna Konta has done a lot this year to convince the Tennis world that her form last year was no fluke. The Brit has improved tenfold over the past 18 months and may like her chances of a deep run here. Konta first must get through Annika Beck then a home favourite before her clash with Suarez Navarro. Halep’s quarter: Halep has had a steady season that has kept her in the top five. The Romanian will head into Wuhan looking to ad another Premier title to her name. She could meet compatriot Irina Begu in the second round, but her recent struggles have been documented. Vinci is the other seed in this section, but her half is littered with dangerous unseeded players such as Puig and Yaroslava Shvedova who found form over the summer. It seems like the tennis world has been waiting forever for the big Keys breakthrough that has been promised since she burst onto the scene. A title win in Wuhan would go a long way to that breakthrough, but the American must focus on her dangerous second prospect in the form of Caroline Garcia or Mirjana Lucic-Baroni. Timea Bacsinszky is the other seed in a section littered with qualifiers. Louisa Chrico is first for the Swiss, then it is either Daria Kasatkina or Julia Goerges. Radwanska’s quarter: The third seed failed to defend her Tokyo title but she can make up lost points with a title run in Wuhan. The Pole will play either Ekaterina Makarova or Sabine Lisicki in round two, so there will be a big hitter to welcome Radwanska to Wuhan. Stosur is the other seed in this section, but it is perhaps Wozniacki who should be the most feared. The Dane is back in form and beat Radwanska in Tokyo. Katerina Siniakova and Timea Babos will meet for the right to face either Stosur or Wozniacki in round two. Muguruza’s quarter: The Spaniard’s struggles have continued into Tokyo, and now the pressure is ramped up with lots of points to defend for the rest of the season. Muguruza faces Jelena Jankovic or Daria Gavrilova in her opening match, both feisty battlers. Anastasia Pavlyuchenkova is the other seed in this section, and she faces Misaki Doi then either Sara Errani or Barbora Strycova before a possible Muguruza meeting in the third round. Pliskova failed to build on her US open final run in Tokyo, but the bigger stakes in Wuhan might bring the Czech back into form. She will likely meet compatriot Lucie Safarova in the second round who is a tough match for anyone. Dominika Cibulkova will be kicking herself for not taking advantage of her draw in Tokyo, but she can make amends in Wuhan. The Slovak faces Alize Cornet then either Laura Siegemund or Danka Kovinic before a potential clash with Pliskova. It is a tough tournament to predict, but when in doubt you go for the top seed. The Shenzhen Open is the first out of three Chinese ATP tournaments which will take place over the next month. Headlined by Tomas Berdych and Marin Cilic, the ATP 250 tournament is a golden opportunity for the lower ranked players to grab some crucial ranking points during the final part of the 2015 season. In the qualifying tournament world No.133 Matthew Ebden headed the field after Austin Krajicek was moved to the main draw following Richard Gasquet’s withdrawal. In his first match Ebden played little known American Nicholas Alexander Reyes. 20-year-old Reyes has won 5 main draw matches in his career and is ranked over 1000 places below Ebden at 1494th. Despite the enormous rankings gap, the match was a much closer encounter as the Australian took the match 6-3, 7-6 (1). 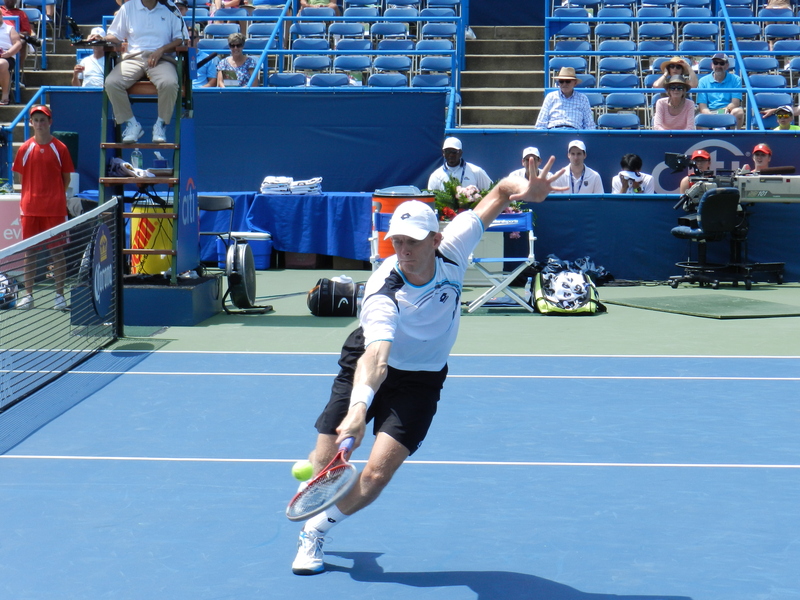 In the final round he played New Zealand’s Michael Venus. Venus defeated sixth seed Lee Duck-hee in the second round after saving a match point during a second set tie-break. Venus was unable to reproduce another upset as Ebden cruised to take the match 6-2, 6-2. Ebden has claimed one Challenger title this year which was at the Aegon Surbiton Trophy in June. The only other seeded player to successfully qualify for the main draw was Japanese 5th seed Hiroki Moriya. Moriya defeated 19-year-old Xia Haitong in his opening match (6-1,6-3) to set up an encounter with France’s Johan Tatlot. Tatlot reached world No.5 in the junior rankings last year and is currently ranked 359th in the world. Tatlor stunned third seed Chen Ti in the second round by winning 6-4,1-6,6-4. Moriya experienced a tough start to the match as he trailed 2-4 before taking five out of the next six games to take the first set. In the second set the world No.219 broke in the penultimate game of the match to win 7-5, 6-3, after eighty minutes. Moriya is yet to win a title this year and has a 2015 main draw win-loss of 9-22. Out of the seven Chinese entrants into the qualifying draw, only one was successful. 18-year-old Zhang Zhizhen produced one of the best wins in his career by beating 4th seed Luke Saville to reach the final stage of qualifying. In the final he played Sergey Betov from Belarus. Betov is currently ranked 73rd in the doubles rankings after claiming four titles on the Challenger circuit this year. The home player was too powerful for Betov as the 18-year-old booked his place in the main draw with a 6-2, 6-3 win. Earlier this year Zhezhen claimed his first Futures title at a F10 event in France. Finally, Takuto Niki enjoyed a milestone competition to reach the main draw. The 27-year-old beat China’s Chen Long in the first round to face 8th seed Mikhail Elgin in the second round. 33-year-old Elgin has won four Future titles this year. Despite being the underdog, Miki stunned the eight seed by winning 6-4, 7-5. The Japanese player was able to continue his winning momentum by defeating China’s Sun Fajing in the final round. He will now play in the main draw of an ATP event for the first time in his career. Matthew Ebden (AUS) v Víctor Estrella Burgos (DOM) – This will be the second time that the two players have met and the first since 2012. In their first encounter Ebden took the match 6-3, 6-2. Hiroki Moriya (JPA) v Ricardas Berankis (LTU) – First meeting. Takuto Niki (JPA) v Bai Yan (CHN) – First meeting. Zhang Zhizhen (CHN) v Go Soeda (JPA) – First meeting. Posted in: ATP. Tagged: 2014, Andy Murray, atp, china, japan, Kei Nishikori, Kuala Lumpur, malaysia, mens, recap, Shenzen, Shenzhen, tennis, Title, tournament. Andy Murray has had his most disappointing season in years, but he did finally win a title in Shenzhen, becoming the first champion in the history of the tournament. The best player in the field this week earned a well-deserved victory in the final over Tommy Robredo 5-7 7-6 6-1. The final was a highly entertaining affair as Murray saved four consecutive match points in the second set tiebreak, and a total of five match points overall. Robredo would physically wilt after dropping the second set, as Murray gained momentum and rolled through the third set. Murray showed further signs of turning the corner as he bids to qualify for the year end World Tour Finals. He beat Somdev Devarrman and Lukas Lacko early on without dropping a set, then topped surprise semifinalist Juan Monaco in 3 sets to reach the final. Robredo continued his strong season. The Spaniard needed consecutive 3 set wins over Sam Groth and Andreas Seppi to reach the semis, but then he easily handled an erratic Santiago Giraldo, who was contesting yet another ATP semifinal this season. Jean-Julien Rojer and Horia Tecau beat the Aussie duo of Sam Groth and Chris Guccione for the doubles title. The top doubles seeds now have six ATP titles together this season. I didn’t see anyone in the draw to stop a red hot Kei Nishikori from winning in Malaysia, and he proved me right, obtaining a 7-6 6-4 victory over Julien Benneteau, who dropped his third consecutive Malaysian Open final and falls to 0-10 overall in career ATP finals. The top Asian player on tour was untroubled by Rajeev Ram and Marinko Matosevic before facing stiffer competition in the semis from Jarkko Nieminen. He survived that in 3 sets and his returning and speedy pace redirection were just too good this week for any opponent. Benneteau extended his perfect record outside of finals in KL. He beat Filip Krajinovic in straights, Pablo Cuevas in 3 sets from a break down in the third, and Ernests Gulbis, the number 2 seed, in straight sets in the semifinals. Marcin Matkowski and Leander Paes beat Jamie Murray and John Peers for the doubles title, denying the Murray family multiple titles this week on tour. Posted in: ATP, Beijing, Tokyo. Tagged: atp, beijing, china, Del Potro, djokovic, japan, men, open, picks, predictions, preview, Rakuten, tennis, tokyo. A pair of strong 500s this week in Beijing and Tokyo are the action this week on the ATP World Tour and here is your preview for both. The Olympic tennis center, the large prize money pool and the prestige of a joint event with the WTA has attracted a boatload of big names to Beijing. Ferrer is 2-0 career against Pospisil, who was shocked by Federico Delbonis in Kuala Lumpur and has been hassled by an inability to close out matches. This match is really only notable because Ferrer has suffered a slate of shocking losses this year and he just had one in Kuala Lumpur to current finalist Joao Sousa. The loss looks better in hindsight, but top 5 players losing to players outside the top 50 is still a shock. I expect Ferrer to win, but can’t be confident of that. This is a Battle Royale of the fighting thirty-something vets for the first time in nine years. Between 2000 and 2004, Hewitt beat Haas six times and lost twice. Much has changed, however and smarter but older, they will renew their rivalry in Beijing. It’s a toss-up match. Novak Djokovic will play Lukas Rosol as he begins his fall campaign and then Fernando Verdasco or a qualifier in round 2. Kuala Lumpur semifinalist and rival Stanislas Wawrinka is his likely quarterfinal opponent, as they could have a rematch of their great US Open match this year (and great AO match in January). Wawrinka needs to beat Andreas Seppi and Mikhail Youzhny/Sam Querrey to reach the quarters. Ferrer/Pospisil will play Marinko Matosevic or current Kuala Lumpur finalist Julien Benneteau in round 2 and then most likely Bangkok semifinalist Richard Gasquet in the quarters. 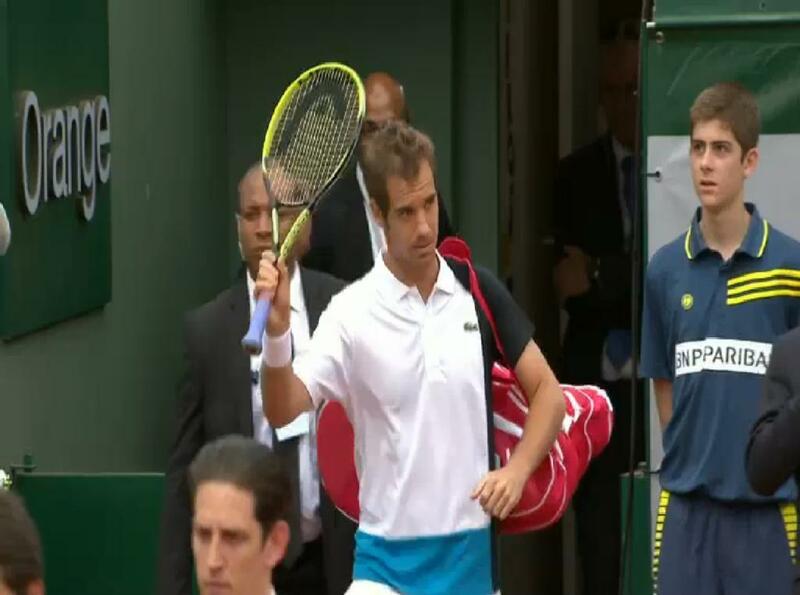 Gasquet has to notch wins over Florian Mayer and Ze Zhang/Bernard Tomic to get there. Gasquet-Ferrer would be a US Open rematch as well. Rafa Nadal also begins his fall campaign in Beijing. His first opponent will be a qualifier before facing Albert Montanes/Philipp Kohlschreiber and one of Haas/Hewitt, Tommy Robredo/Fabio Fognini in the quarters. Not the easiest draw, but he took care of Kohli at the USO and has a positive recent record against the other players. Tomas Berdych is a finalist in Bangkok.He opens with Pablo Andujar before advancing to Nikolay Davydenko/Qualifier and most likely John Isner in the quarters. Isner plays Chinese wild card Di Wu, followed by Grigor Dimitrov/Qualifier before the quarters. If Berdych is tired, Isner becomes the favorite in his quarter as he has a pretty weak first couple of matches before running into Berdych. Semis are possible but not likely for the American. Djokovic has only lost to Gasquet once and has handled him well in a ton of other meetings. He is in good form judging from Davis Cup and should be fine here. Nadal hasn’t lost to Berdych in 7 years. He also looks to be in good form and has beaten Berdych 3 times this year, so he should be good. A rematch of the USO final and a bunch of other matches. I expect the same result, but it could still go either way between the best 2 players in the world right now. Djokovic is the defending champion and has won Beijing three times, but Nadal is seeking to take the number 1 ranking from him. These two fan favorites have met four times on the ATP tour and all on hard courts like this meeting. The head to head is even, meaning the winner will get the positive edge. Del Potro owned their meeting in Dubai early this year in a third set tiebreak and is hopefully recovered from injury issues that have bothered him all year and dogged him at his last event, the US Open. Baghdatis is a disappointing 1-2 in his first two events of the fall ATP season. 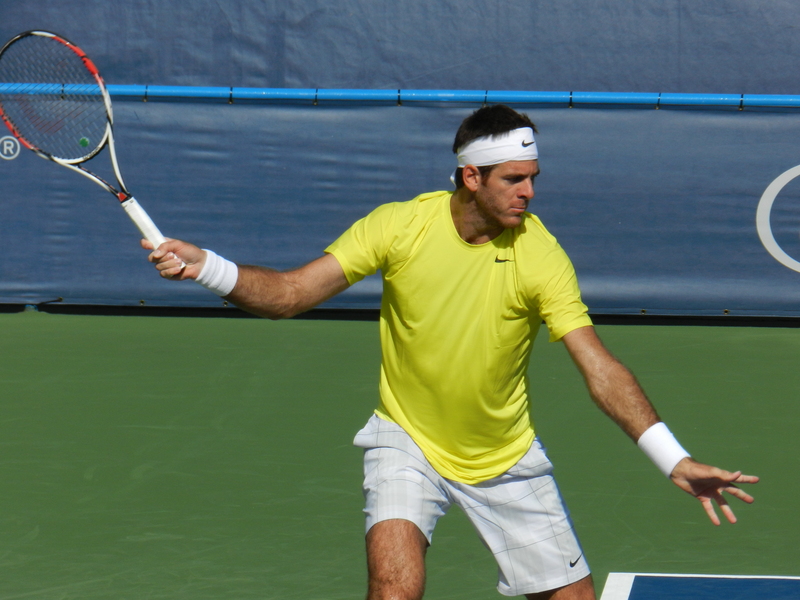 Del Potro will be the favorite if healthy, but Baghdatis could surprise. Nishikori is the home hero and the defending champion, meaning he has a considerable amount of pressure here. Melzer, meanwhile, made the semis in Kuala Lumpur and seems to be in ok form. They have a split 1-1 H2H, with Melzer winning their only hard court meeting 4 years ago. Nishikori won on clay in Madrid this year. Nishikori performed well in his last event, a Davis Cup tie, and will be the favorite here. Tsonga has a 3-1 H2H edge over his fellow Frenchman and is probably in better form. All of their prior meetings have been on hard courts. Both players have been hassled with injury problems, but can play brilliant tennis when they’re on, and that is why this match is one to watch between charismatic fan favorites. Tsonga should prevail, but Monfils always has a chance against most anyone. The Del Potro/Baghdatis winner will face Carlos Berlocq or Pablo Cuevas in round 2. Cuevas upset Nikolay Davydenko in Kuala Lumpur. In the quarterfinals, it will probably be Del Potro vs Alex Dolgopolov or Janko Tipsarevic, a couple of players who have had a downright terrible year of tennis. Also in this section are Victor Hanescu and Daniel Brands and if Del Potro is healthy he seems secure for the semis. Otherwise, who knows? Nishikori/Melzer will likely play Bangkok quarterfinalist Feliciano Lopez in round 2. Feli just has to beat Tatsuma Ito. Following that, it will be a weak quarterfinal against one of a pair of qualifiers, a slumping Nicolas Almagro, or a slumping Horacio Zeballos. Super-Weak section for a 500. Tsonga/Monfils could get a possibly tough test against Ivan Dodig in round 2 if Dodig beats wild card Yuichi Sugita. A quarterfinal awaits against in-form Bangkok semifinalist and Metz champion Gilles Simon if Simon beats Marcel Granollers and Jarkko Nieminen/Juan Monaco (neither of whom are in good form, but can catch fire). Tsonga vs. Simon in the quarters would be a rematch of the Metz final, won by Simon. Current Bangkok finalist Milos Raonic plays Go Soeda and then Jeremy Chardy/Michael Llodra in what should be an easy start for the possibly-fatigued Canadian. 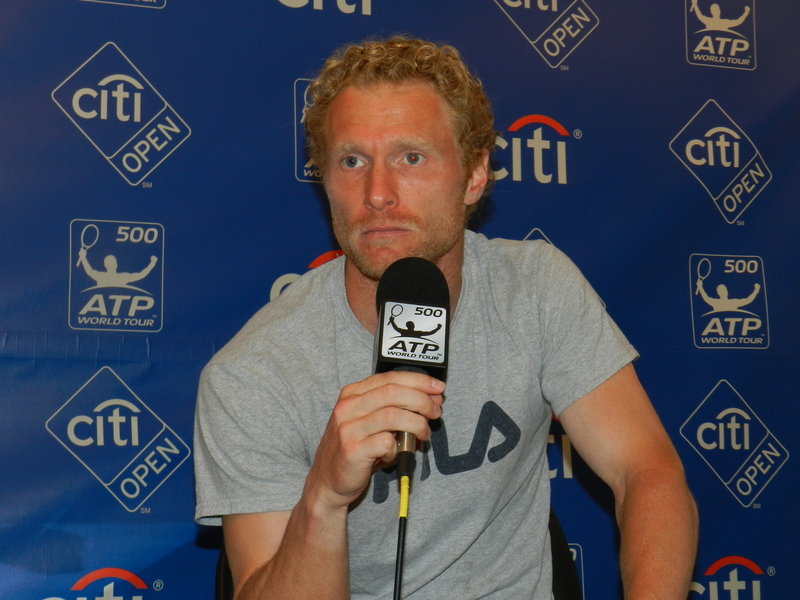 A pair of qualifiers, Dmitry Tursunov or Kevin Anderson await in the quarters in a tough test. Tursunov come off quarterfinals in Kuala Lumpur, which was preceded by quarterfinals in St. Petersburg and a generally good year. Opening with a qualifier and then the unpredictable form of Kevin Anderson gives Tursunov a sniff at the quarterfinals again, with Raonic, who could be tired, probably awaiting. Del Po has never lost to Nishikori, so unless his wrist or some other body part is giving him trouble, I think he survives to the final. I like Simon form-wise if he isn’t too tired over Tsonga and then over Raonic, who he has only played once on clay 2 years ago. Not much to go on there. Simon has a 3-1 edge on hardcourts, and this matchup is good for him. 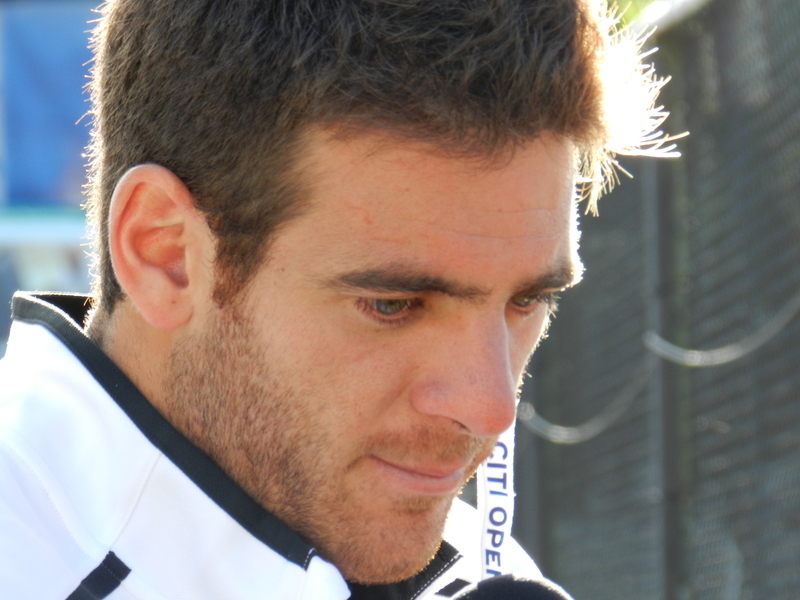 But I think Del Potro, if healthy, will just be too much, as he will be fresher if this final occurs. Either way, a hard pick here. The second to last ATP masters event of the year and the pinnacle of the fall Asian swing will begin tomorrow in the early morning hours. 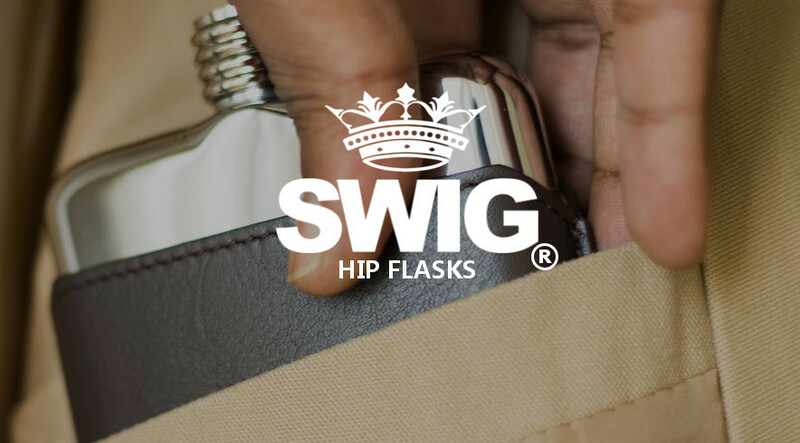 Here is a preview. Tomic was upset by Dmitry Tursunov in the first round of Tokyo after making the quarters in Bangkok and he will have to take on Mayer, who came out of nowhere to make the Beijing semis before falling to Novak Djokovic. Admittedly, Mayer didn’t have a tough draw to get to the semis. Mayer remains in the top 30 even though he has a losing record on the year and it will be interesting to see if he can carry his fine play into Shanghai against Tomic and beyond. 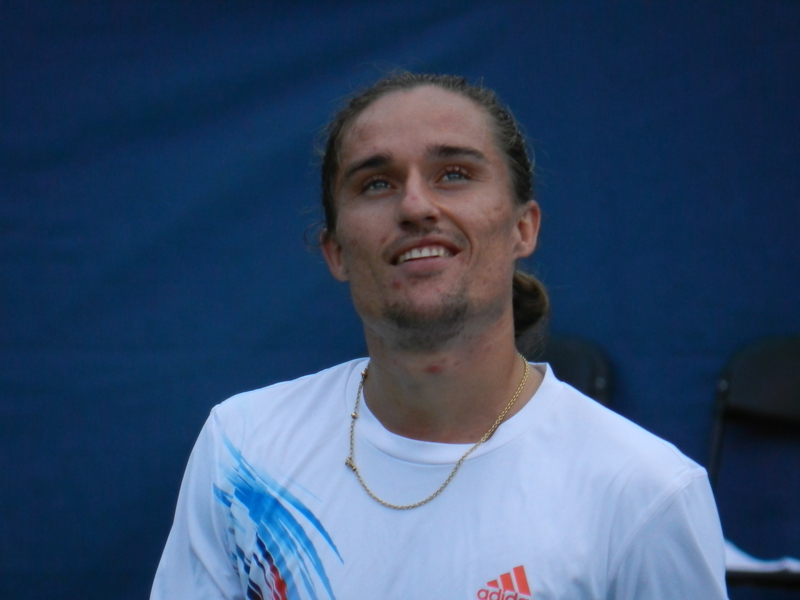 Dolgo continued his astounding inconsistency in Beijing, losing in the 2nd round to a slumping Jurgen Melzer after previously losing his first match in Malaysia. He faces Chardy, who lost in the 2nd round of Tokyo but is slightly more consistent. On paper, Dolgo should advance but look for Chardy to pull one out. Nieminen was upset in the first round of Tokyo by Tommy Robredo, but that was coming off a semi in Bangkok so he may have been fatigued. Anderson, on the other hand, has had a pretty abysmal 2012. He just lost in the 2nd round of Beijing and is barely over .500 on the year. He has not won 2 straight main draw matches since DC. While they are only 1 spot apart in the rankings (35 and 36), look for the vet Nieminen to advance off of recent form (although he is also just over .500 on the year). Tommy Haas has slowed down since his red hot spring and summer, losing in the first round of Beijing after previously losing in the 1st round of the US Open. He will take on Almagro, who was just upset in the first round of Tokyo but has come back from injury in pretty solid form. If Haas can channel his previous form, he could pull the upset but Almagro will be the favorite. In a battle of two lefties, Lopez made a surprising run to the Beijing semis before falling to Jo-Wilfried Tsonga and retiring with a wrist injury. Falla lost in the 2nd round of Tokyo, but did make the quarters in Bangkok. This match is interesting based on the physical condition of both players and is a toss-up. Roger Federer returns to tournament action and will face either a qualifier or surprising Beijing quarterfinalist Zhang Ze, who usually does his work at the challenger level. Then he likely faces countryman Stan Wawrinka in the 3rd round and Juan Monaco, Marin Cilic, Martin Klizan or Fernando Verdasco in the quarters. Cilic, who was upset in the 1st round of Beijing by challenger stalwart Marius Copil, likely plays Klizan, who was upset in the 1st round at Tokyo by Marco Chiudinelli. That should be a good 2nd round match up. Kuala Lumpur champ Monaco, who was upset in the 2nd round of Tokyo by Marcos Baghdatis will likely have to deal with Fernando Verdasco in the 2nd round. Verdasco lost to Sam Querrey in the 1st round of Beijing and plays Go Soeda in the opening round. Andy Murray, coming off a loss to Milos Raonic in the Tokyo semis and falling to defend his title in Tokyo, will attempt to defend another title this week in Shanghai. Murray opens with the winner of Mayer/Tomic and then could get Bangkok finalist Gilles Simon or Chardy/Dolgopolov in the 3rd round. He should be able to beat them all, but they are still tricky matchups. In the quarters, Murray could get John Isner, who returns to tournament action, Bangkok champ Richard Gasquet who comes off a 2nd round loss in Beijing to Ze Zhang or Jarkko Nieminen, who would play Isner in a US Open rematch. Also in this part of the draw are Radek Stepanek and Lleyton Hewitt, who will battle each other. Novak Djokovic, who is currrently playing for the Beijing title, will play either Pablo Andujar or Grigor Dimitrov in the 2nd round. He could then could face Phillip Kohlschreiber in the 3rd round if Peppo can get past slumping Ryan Harrison and Lopez/Falla. Kohlschreiber last suffered a shock loss to Adrian Mannarino in the Orleans challenger. In the quarters, Novak likely faces countryman Janko Tipsarevic for the 4th time in 2012. Djokovic has won both hard court encounters. Tipsarevic lost in the quarters to Raonic in Tokyo and will play the winner of Mikhail Youzhny vs. Viktor Troicki in the 2nd round. In the 3rd round, he likely faces Almagro or Haas. Tomas Berdych, who lost in the Tokyo quarters to Kei Nishikori, opens against either Andreas Seppi or a qualifier then likely faces Nishikori in a 3rd round rematch. Nishikori, who plays Raonic for the Tokyo final at home, plays Chinese wild card Wu Di and likely Beijing quarterfinalist Sam Querrey in the 2nd round. 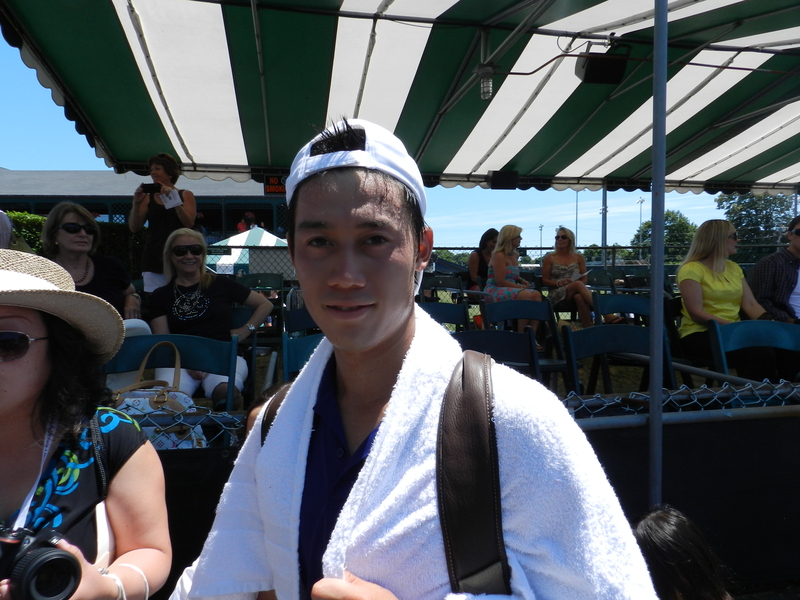 Look for Nishikori to have a nice shot at winning again. Jo-Wilfried Tsonga, who will play Djokovic in the Beijing final, plays either countryman Benoit Paire or a qualifier in the 2nd round. After that, he likely runs into Raonic in a battle of last week’s champions. Marcos Baghdatis, a Tokyo semifinalist is also in this part of the draw against St. Petersburg finalist Fabio Fognini and then likely Raonic. A lot of really good recent results in this part of the draw and some hot players make this the section to watch. It is not an easy draw for Nishikori and he won’t have the advantage of home cooking like he did in Tokyo, but if he can skirt past Querrey and beat Berdych again he will have a nice shot at the semis against either Tsonga or Raonic. Anybody In this part of the draw is a possible dark horse from Raonic to Baghdatis to Querrey. Djokovic would be the semi-final opponent. Djoker should be able to make it two titles in a row winning Beijing tomorrow and Shanghai next week to complete the China double.